I was recently hired at a well-known music studio in my area, mostly by chance (I didn't think they'd be interested in me). They mainly teach Suzuki, and although I grew up learning through the Suzuki method from age 8-11, I am not certified and not very familiar with the exact methodologies and therefore don't have a lot of pedagogical knowledge. So, to aid in my learning, what are some activities, tips, and tricks that you Suzuki people use in your instruction? What ideas do you have to teach rhythm notation before going to the staff, and how would you write Mississippi Hot Dog and the like in a way that is readable without being standard notation? My youngest private student (who is my own, not part of the program) is 8. I don't have any experience teaching very young ones, so help with that would be amazing! He wants me to put together a curriculum and the first ten lessons of a new beginner. I figure a Year One Curriculum would suffice for now. What would a typical student learn in a year? I designated this curriculum for ages 7-10. Any online resources you have would be more than helpful. I've done some searching, but haven't found much. Typical student: Suzuki Book 1, perhaps half of Book 2. Amazing student: Books 1 and 2, some of Book 3, elementary shifting (first shift is in "Humoresque"), starting Hrimaly scales, first two pieces or so in Volume 1 of Solos for Young Violinists. Always with keen attention to posture, hand positions, straight bowing, bow strokes, intonation, musicality, dynamics, even tempo, caring properly for the instrument and case, respect for you and other students, and, of course, enjoyment of the violin. Don't invent your own musical notation. Mississippi Hot Dog is easy enough to learn by ear. Students will translate their ear learning to the printed page soon enough. You can use "I Can Read Music" if they need help. Consider the following. Buy a camcorder and keep it set up in your studio. Ask parents to bring with them a suitably-sized SD card. Record the whole lesson on their SD card without stopping the tape, and then at the end hand it back to them. Have written agreement that lessons cannot be posted online. They are only for individual review at home. Inasmuch as you previously, in another thread, said that you left off with the Fiocco Allegro in your own training, I would suggest that you consider not trying to teach students beyond a certain level. I'm not sure what that level should be, but it shouldn't be the Fiocco Allegro. February 12, 2019, 8:18 AM · I think you really need to take actual Suzuki training. There is no replacement for it. You should be able to find an Every Child Can class not too far away. These are usually only a day and will give you so much of the background. https://suzukiassociation.org/events/course/ecc/ Read Nurtured by Love. And then take a Book 1 class this summer. I would also suggest observing lessons and group classes at the very best Suzuki program in your area -- most teachers are very willing to allow observers. February 12, 2019, 8:50 AM · I would love to take Suzuki courses, and I want to this summer (it's just $$$$). However, my boss said that he is alright with me not being certified yet because they have a long line of prospective students, and hardly any applicants. He says he sees a lot of potential and good motivation in me. It's also a job I can't pass up, even though I may be a bit under-qualified. It pays very well for part-time and the environment is superb. All the other teachers have Master's degrees in performance (mine will be in education). I have been observing other classes they provide like the beginning guitar class and an early childhood general music class. As for rep, I've done more than the Fiocco, but that's just the last solo festival piece I did when I was 13. Over the past two years, I've done the Gigue from Partita 2, some small pieces, Wohlfhart, (revisited) Suzuki 1-4, most of Suzuki 5, and some of 6. I dabbled in 7, but would take some real work to get it. I learned the Mozart Minuet pretty well in 7 in 45-min to an hour. I play second violin in my town's semi-pro orchestra. Teaching technique is no problem for me. Both of my new students who started over the summer got full marks on their first solo festival last month. I'm mostly interested in advice for moving from playing by ear to real notation, and what progress I should be looking for so I can write my curriculum. Right now I have written that students should know all open string scales by the end of year one. Can they do more? Should I add C and F in there? Any two octaves (ex. A and G)? I think I'd start without the staff and just work on note values first, and then introduce time signatures, and when they can count and play rhythms, then introduce note reading. Would you guys recommend Barbara Barber's beginning scale book? I have her advanced book and I love it, but I'm not sure if it's used in Suzuki. Edited: February 12, 2019, 9:42 AM · Barbara Barber's beginning scale book is very very good. So is Hrimaly which you can get on IMSLP. It's good to have an idea what your clients' budgets are like for extras. Many lay people are just not calibrated to how expensive music education is, and you have to ease them into it. The Mozart piece in Book 7 is not representative of that level. The Bach A Minor Concerto is the signature piece of Book 7. Edited: February 12, 2019, 9:43 AM · Suzuki teachers don't get certified. They just get training. You do need to pass an audition. I'm guessing your playing level isn't sufficient to pass the comprehensive audition (first movement of Mozart 4 or 5, with cadenza). The next level down is Bach A minor. If you can't play a passable Bach A minor, there's an audition that uses book 4 repertoire -- check the SAA's website. There are plenty of places you can go in the summer where you can take Every Child Can plus Book 1 training back to back. In the meantime, read Suzuki's books ("Nurtured by Love" and "Ability Development from Age Zero"), William Starr's "To Learn With Love" and "The Suzuki Violinist". I disagree with Paul. I think book 1 is usually a year to a year and a half for most students, if you're really establishing a solid foundation. February 12, 2019, 9:44 AM · I'm just going by what I've seen in my teacher's studio. Kristen said 7-10 years old. If she said 4-5, my answer would have been different. But I do agree with Lydia that it does depend on how solidly you lay the foundation -- and how well you teach!! My teacher is exceptionally good with little kids and they make good progress under his tutelage. Having 25+ years of experience is definitely to his advantage. February 12, 2019, 10:00 AM · Thanks, guys. I agree that I am in no place to play the Mozart. I tried... It was terrible! I would definitely be uncomfortable teaching past book 4, so I hope he hires more advanced people so I can just have the little ones. It's times like these that I really regret stopping instruction (especially at such a pivotal time in development; I was 13 and well on my way to being really good. I was asst. concertmaster since 4th grade, but always surpassed by my best friend who started at 5), but on the other side of the coin I'm grateful that I switched because I turned out to be a pretty darn good oboist, and the dual experience is attractive for public schools. I think the ECC would be really beneficial even as just a stepping stone. I'm in NY, so the closest place to take the course would be Ithaca. I haven't started teaching yet, but my boss said he and the other staff will be there to help guide me as I start out. I'll have the Barber scale book available (I'm debating giving them photocopies so they don't have to buy it, but I'm not sure if that's legal.. ) and I'll look into the I Can Read Music book. Edited: February 12, 2019, 11:24 AM · "I'm debating giving them photocopies so they don't have to buy it, but I'm not sure if that's legal." You absolutely do not want to go down that road. That's an egregious copyright infringement. Your clients need to understand that musicians, arrangers, composers, publishers, distributors, and your local music store all need to put bread on the table. Not only should they be buying the books, but they should ideally be buying them at the local music store rather than saving $0.30 or whatever to get them online. If your local music store doesn't have them, and you're building a violin studio, you might give the local store a heads-up that they might want to have a few copies of this or that available, because you're going to encourage your clients to buy local. They might want to have a cake or two of whatever kind of rosin you recommend and a spare Goldbrokat E string. You're not just building a business. You're becoming part of a network of businesses that extends through your community and beyond. If you're good to them, they'll be good to you. If you bring business to the local music store, they might recommend you for lessons. Very often the local music store is the first place people ask. February 12, 2019, 12:19 PM · I agree strongly with Paul. By the way, before you have training, please don't call yourself a Suzuki teacher. You can, of course, use the Suzuki materials without being a Suzuki teacher. The Suzuki Method is initially a by-ear method. Kids listen to the Suzuki CD (which is packaged with the book) for a recommended 1 to 2 hours a day. They may learn to read music away from the violin, but they do not try to read from the notes until later on. It may not make sense to ask a beginner to buy a scale book. They can play the primary one-octave scales without using a scale book. ECC is a one-day course that is mostly about the philosophy of the Suzuki Method. It is non-instrument-specific and it's designed to be taken not just by teachers, but also potentially by parents as well. You'd need to take the Book 1 course in order to actually understand the structure and intent of the book 1 material. If you intend to take the courses in the summer, you should submit your audition ASAP and register for the courses soon. You get a discount for an early audition, and if you're uncertain you'll pass the audition (which sounds like a possibility given your current playing level), you'll want the chance to repeat the audition until you pass. February 12, 2019, 12:51 PM · Lydia said that SAA does not "certify" teachers. That may be true, but I think if I enrolled in a $600 training course, I'd want some documentation that I had attended and completed the course. I'd be surprised if that's not provided. If you don't get it, ask for it. February 12, 2019, 12:56 PM · I second, third, etc. the suggestion of training and observations. Suzuki is much more than the pieces, playing by ear, and teaching young children (although it does include all of these). - Scales: I have my beginners playing scales by ear (because they aren't reading yet), starting with A major after/when we start 4th finger and then generally matching up scales with repertoire. G major 2 octaves is fine in late book 1 while F major is more like mid book 2. - Book 1 in 2 years is considered fast in my studio. Even the 7 year old beginners run the gamut from Twinkle for 1 year to half the book in 1 year. I'm certain that practice is a correlating factor. - I'm only slightly kidding when I say I'd like to apologize to my longest-ago students. There are many things I've found better ways (and will still find) to do, that they didn't benefit from, because I continue to learn and adjust each year! So just know that your teaching and ideas will grow with you. If this guy wants to pay for your Suzuki training, that's fine, but I would examine any fine print in the deal. He may want to have you agree to teach at his studio for X number of years since he invested in the training. And he might have you sign a non-compete clause. Personally, I wouldn't sign something like that. If you get Suzuki training and some experience, you will probably make a lot more on your own. Yes, experience and training are both what you need, so go for both! If you can be helped in getting that training sooner, all the better. I did Books 1-4 at an academic institution, over the course of a year, then the other books on a summer-by-summer basis. I was actually pretty glad I spread it out because it gave me time to think, let things sink in, etc. But the sooner you can get started and also connect with some people who can mentor you, the better. Also, the entire idea of Suzuki is to go at a child's pace, so let's not label a "slow" student, etc. I've seen students spend a year on Twinkle and then become very solid violinists who go on to play to a high level and even major in music. That said, there is usually a correlation between the amount of practice time and the rate of progress, which is well-illustrated in this chart, which I find to be pretty darned accurate! It perhaps goes without saying that if a child begins at a very young age, their ability to practice for a certain amount of time each day is constrained by their attention span, and that is okay! "Meet each student where he or she is at," as Suzuki would say. February 12, 2019, 1:47 PM · Also, look into Music Mind Games for teaching early reading concepts to young kids. Edited: February 12, 2019, 2:27 PM · I agree with all the preceding comments about observing lessons and getting the Suzuki training. It is really a shame you can't do this before starting to teach in this studio. I feel very strongly that you should not try to teach anyone beyond about Suzuki book 4 level. Period, full stop, by your own description you would not be doing more advanced students a service by trying to teach them. I also very very very much hope that this studio does not bill itself as giving "Suzuki instruction" because in your case, that will not be true. Please do not put a lot of weight in your private students' ratings at a solo & ensemble contest. Some very good students get 1's, of course. So do some students whose technique and intonation make me weep. It varies by location but around here, while getting a top rating at the State festival is usually a solid indicator, the local s & e contests tend to be feel-good events. I strongly recommend that you buy and read "The Suzuki Violinist" by William Starr. Editing to add that the difference between teaching a five-year-old and teaching an eight-year-old is HUGE. The teaching of very young children is an art in itself and demands a skill set that you are not likely to have without at the very least observing quite a number of other very young children being taught by successful teachers (usually Suzuki-trained in this age group). 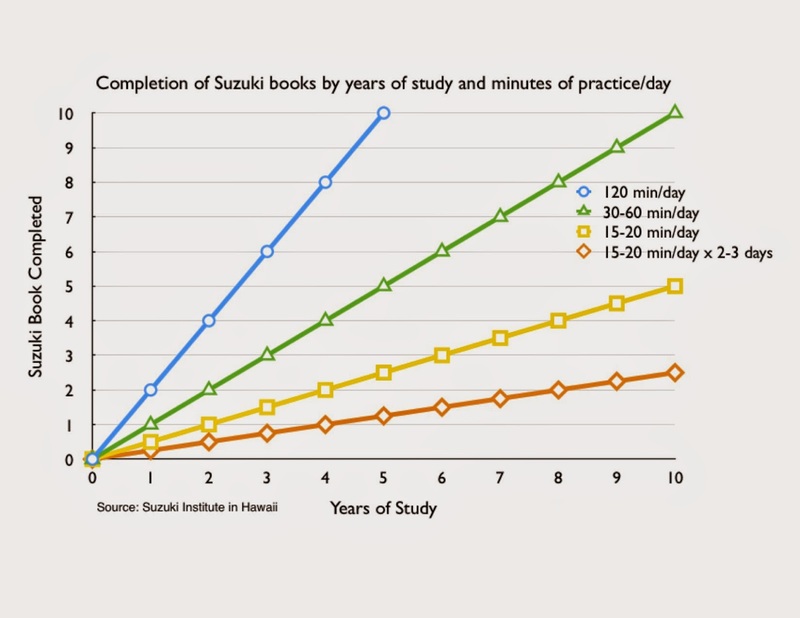 February 12, 2019, 3:21 PM · Yeah, you're going to find that getting through 1.5 Suzuki books in a year with solid foundation certainly isn't "typical.". But it does really depend on the type of students that the school attracts. It's rarely the ability if the student that limits this speed, but rather their unwillingness to practice in a high quality way at home, and usually their parent's unwillingness to help. As Lydia noted, 1.5 years to get though book 1 with a high quality is more of an "average." And even that is probably a bit optimistic if if we're discussing average students that attend public school and don't think of music as important. February 12, 2019, 4:02 PM · "Suzuki" is a philosophy which goes beyond learning the mechanics of playing an instrument, and I think one would be doing a disservice to the parents and children adopting that name without a full grounding in what it means and what are the generally prescribed practices in it. This is not to say that the mechanics of playing violin are unimportant - they are absolutely critical to successful playing; however, Suzuki has an additional view on it which is also to be respected when adopting the name. And as a parent who got my child into playing once I heard of a recommendation for local Suzuki offering, and having done some of that myself and with my child, I feel that the parental involvement aspect of Suzuki is among its most important benefits. February 12, 2019, 4:21 PM · It's not strictly "Suzuki" but the book I use before and alongside book 1 is the Blue Book of Violin Tunes by Bonnie Greene, published by One World Strings. It's not super common and I don't know if you can gt it from SHAR or the like, but it is a really good resource alongside Suzuki with opportunities to ground in notation as well. Has some scales written in, has several early songs in letter names as well as notes, has flashcards. If you are not Suzuki-trained (even if you are but prefer teaching notation side by side with your age range) and especially if you're newer to teaching beginners, I would strongly suggest using a resource like this. Suzuki can be lovely but without the training or some experience working with it, the book doesn't give a new teacher much to go on as far as *what* to teach with and for each tune. I don't know if it's free anywhere, but Mimi Zweig has a lot of online training materials which I believe include sequencing of beginner concepts. Hers is kind of "Suzuki plus", not straight Suzuki but uses the amterial and works well with a Suzuki philosophy. February 12, 2019, 5:53 PM · For little ones, I also recommend Step by Step: An Introduction to Successful Practice for Violin (Book & CD) by Kerstin Wartber. These books go along with the Suzuki books. And for starting note reading and theory skills, all the Avsharian books are awesome. February 12, 2019, 7:49 PM · I met with my boss again today to play through some stuff, to get to know the other staff, and to get a game plan. I wrote the curriculum based on a bit of research and my own prior knowledge, and he said he loved it. I told him my concerns about not being a virtuoso by any means, and having that ten year gap in instruction (which, by the way, you guys make it seem like I'm a really poor violinist, and that's not what I came here for... Just saying. I know my limits. ), and he said he is more interested in my pedagogical knowledge and teaching ability. Many of the best performers are terrible teachers. I may not be doing the Suzuki school right now, but that doesn't mean I can't learn by observing other classes and talking to my colleagues. Obviously I'm not going to photocopy music... And yes, I think scale books are important. Learn by ear, and then hone the skills with notated music. That's how I was taught. February 12, 2019, 7:50 PM · Also, Laurie, thank you! You are truly helpful! February 12, 2019, 8:06 PM · There is no Suzuki certification. Otherwise, everyone would be teaching the very same thing, the very same way. As Dr. Suzuki said, you're not teaching the Suzuki method, you are teaching the (insert you or your teachers name) Jim/Suzuki Method. When you complete the training in Every Child Can (ECC) or individual books (or optional areas like "Sonatas"), the training documentation is submitted to the SAA, and they register your training. Our family didn't go on vacations for years, because "our vacation" WAS going to Suzuki institutes (primarily Stevens Point WI). Sometimes we'd go biking for an extra week while there (the Elroy-Sparta bike trail was a favorite). Our teaching got re-inspired, and our children loved the experience too--it charged their "playing batteries" until the next summer, and it was where Craig Timmerman inspired our children to the 100 days of practice, and it grew to years)! And I'd love to reiterate some important points from above. Get Suzuki training! It is the best investment you can make in your teaching, AND your students learning! If you don't get training, it's like taking your car for repair to the guy who fixes your lawnmower. Yes, both use an internal combustion engine, but the differences are huge. Yes, any musician can teach using a Suzuki book, but won't know anything about the "why something is in there". Huge teaching points will be ignored or simply glossed over because you don't recognize the road signs. And please don't photocopy music for your students. Aside from the obvious copyright infringement, you are doing NO service to your student(s) by giving them photocopies that will deteriorate in a few years, or get lost the next week...And it will also never end, because they will always expect you to supply photocopies for them. February 12, 2019, 8:59 PM · I'm not gonna photocopy... I was merely thinking out loud, please relax, everybody. I've said I'm planning on getting training. I don't have disposable income to drop that much money right now. It'll happen in time. I've got the info I need, thank you all. Note that SAA gives scholarships for training, so it's not impossible to take training if you don't have money on hand. February 12, 2019, 10:19 PM · Lydia yes that's what I had in mind. That would be good enough for Kristen. February 12, 2019, 11:40 PM · I know what I need to do, thanks a ton. I won't have money for the summer, or possibly fall. It'll have to wait. In the meantime I'll learn through immersion, coaching from my colleagues, and research. How many teachers have a curriculum for new beginners? The notion of putting together what goes into the first ten lessons seems odd to me. I personally have a curriculum based on milestones and goals for approximately the first 8 lessons. I go into each lesson knowing what I want to accomplish and how I plan to get there, but it's not much more detailed than that. Sometimes this get's thrown out the window after the first lesson. Sometimes it runs it's full course. Because each student is unique it's hard to be more specific than that. This much I can do because there is a lot of general information for guitar that you can establish before specialization into classical technique and I like to give that foundation. Once that's done I usually try a few methods to see what fits best with their practice ethic and specific interests. Most of the teachers I've worked with have a similar roadmap, but I don't know if any of them have a specific curriculum unless they follow a specific method book for teaching right out of the gate. Violin of course has greater physical challenges to a new player, so I can imagine delays being more frequent and challenging to over come. February 13, 2019, 12:25 AM · What I would like to say is, dont turn into all-Suzuki-nothing-else-teacher. And remember that not all students are the same and be prepaired to adapt Suzuki to the students. Suzuki is a very good starting method but it should be adapted according to the students needs and capabilities if you want to teach all the students with the love that is also a great principle in the Suzuki method. As many probably remember, Ive got a 5 year old (now in the last piece of book 3), who never really got the language method of Suzuki. Or the learning only by ear method. The rhymes that Suzuki starts with mostly never helped her, they just made things more difficult so essentially she learned the rythms without any words, listening to the beat straight. And she learned to read the music at 4 years (luckily her teacher does not teach the purest form of Suzuki) and has since learned the pieces from the music. And it is not possible for her to play by heart several pieces. Her memory just does not hold so many pieces at the same time. So before she started I always thought that everything in the Suzuki method is good for everyone but since I have learned that there are little violinists capable of playing the violin well that just dont function the way Suzuki said everyone child should. So I only hope that every starting Suzuki teacher would teach with open eyes and not go into the habit of trusting only the way Suzuki taught instaid of adapting to the capabilities of every single child. Edited: February 13, 2019, 6:23 AM · Lydia frankly I really only see semantic difference between "registration" of one's training and "certification." But I'm not quibbling. I realize that "certification" might carry different connotations. Also, while the "teacher training" that one gets at a Suzuki-approved workshop may indeed be valuable, it's only going to scratch the surface of what one needs to really be successful anyway. The advantage of having some "lesson plans" for new students is that if you've got a new student coming for his or her first lesson, you can remember to bring along your Foot Chart. @Maria -- my daughter also preferred to learn her pieces by reading the music from early in Book 1. And doing so allowed her to make rapid progress through the first few books. Then came music camp and she was expected to learn fiddle tunes by ear, and she struggled with that. So, just as ear-learners need eventually to learn to read (including sight-reading), non-ear-learners eventually need to gain that skill, which means devoting both lesson-time and practice-time to it. My other daughter was just the other way around -- she learns by ear and reading was a challenge, but she overcame that with effort and instruction. February 13, 2019, 6:41 AM · He wanted the first ten lessons to get a feel for my lesson planning skills. Also, I think Suzuki is great for the beginner (say through book 2 or part through 3). But, I've been through so many methods with all the instruments I've taken lessons for that my teaching style is not limited to just one. Suzuki isn't the be-all-end-all of methods; I think it's important to incorporate other methods based on the student and his or her needs. Kid is having huge issues keeping a beat? I might pull out some Orff ideas like body percussion. The kid can't feel the style of a waltz? Time to do some dancing and moving. If I've got a kiddo who is a little older and only counts with Gordon syllables? Great, I'm going to use it and numbers. Some Suzuki stuff might not work for some kids, so I've gotta use other ideas until they get it. February 13, 2019, 8:19 AM · For a beginning scale book, I highly recommend the book "Fiddle Time Scales" it has all of the basic first position major and minor scales and major/minor arpeggios, plus short, fun pieces in each key (including some pieces encouraging composition/improvisaton). I have been using it with my students starting somewhere between mid book 1 and early book 2 (depending on age and reading proficiency) and so far they all absolutely love it. The Barber "Scales for Young Violinists" is a fantastic book, but it is more for two octave scales (including shifting) and and wouldn't start this until at least late book 2 (I do usually start shifting in either book 2 or book 3 (again depending on age and other factors). I would agree with Lydia that you shouldn't advertise as a "Suzuki" teacher without taking training (doesn't mean you can't be a good "Violin teacher"). I actually have training through book 4, but I don't call myself a Suzuki teacher because while I incorporate some aspects of the method, I don't fully implement some core aspects of the method (my students don't only learn by ear, or keep all of their repertoire memorized, for example). That said, Suzuki training is, in my opinion, invaluable for becoming a good teacher. It is one of the few ways to get an organized training in violin pedagogy. (There are a few others, such as Mimi Zweig's workshop at Indiana University, the Paul Rolland Workshop, Mark O'Connor method training, etc, but none are quite as thorough an organized step by step). Like Michael, I have a general map though not completely written out because so much depends on the actual student. A 10-lesson curriculum doesn't mean only 10 lessons though. If a student didn't practice/master what was required between Lesson 1 and Lesson 2, well, we're doing the content of Lesson 1 again (even though the delivery may change the more times it has to be repeated...). I think Kristen is prepared to get into her adventure. It's maybe a mix of intimidating (she said "didn't think they'd be interested" and called herself "a bit under-qualified") and exciting (following a passion, being paid for it). I know what it's like being the only non performance degreed person around yet have people (like her boss) be willing to look past that. She's being thoughtful about next steps and can have a chance to land a scholarship for next year. There are early students who in hindsight I wish I had taught differently, and I would think most teachers go through this after hundreds of students pass through their doors. And now I'm compelled to continue my quest in dispelling misconceptions. 1) Thank you to Lydia & Paul for mentioning this - yes it's a losing battle in semantics: "certification" implies an exit evaluation, continuing regulation, etc. and training is not that. 2) Suzuki is not "only by ear" but is "delayed reading" (not: no reading). As Paul said, by ear and by reading are both components of music literacy. 3) There is no "pure Suzuki" because the man is gone; everyone following takes his ideas and infuses them with their own. 4) Adapting to a child's needs, as Kristen gave examples of, is good teaching, not a characteristic of "Suzuki" or "non Suzuki". Edited: February 13, 2019, 11:48 PM · Mengwei, I suspect it's not so much "performance degree" as Kirsten is basically an early-intermediate violinist herself (studied violin to book 6 level, and notes that book 7 material would take "real work"). That's a pretty big challenge. Someone at that level can teach beginners assuming that they have a good set-up themselves and a good understanding of basic technique. Some parents might be understandably wary about sending their kids to someone who plays at that level, though. This intersects interestingly with Anita Kaul's struggles over on another thread. She originally learned the violin from someone who was a high schooler but wasn't really at a teaching level of advancement -- but who was more advanced than Kirsten. That foundation seems to have haunted her through the years. That's why Mary Ellen is recommending that Kirsten teach only beginners -- to avoid doing damage to a student who has the potential to go farther on the violin. February 14, 2019, 1:18 AM · Lydia is exactly right. The thing about teaching violin is that being able to play better (hopefully much better) than one's best students is necessary but not sufficient. One has to understand the "why" as well as the "how" in order to teach most effectively. Edited: February 14, 2019, 7:12 AM · Mengwei wrote, "There is no 'pure Suzuki' because the man is gone; everyone following takes his ideas and infuses them with their own." A remarkably perceptive and far-reaching statement. The word "Suzuki" could just as well have been "Christianity" or "Islam" or "Buddhism" or "Marxism." What I've seen on websites and other marketing materials are phrases like "degree in violin" or "music degree" or "performance training" ... phrases that step carefully around the fact that the individual does not have a performance degree, or does not have even a music degree, or might have left college without earning a degree, etc. If students emerge from Kristen's studio having completed Book 2 with perhaps some flaws in their fundamentals but also burning desires to become at least decent amateur violinists, I'd call that a good outcome. We don't know where she lives or teaches. Maybe in that community there aren't other options. The next teacher can fix the technical problems, hopefully only minor things. The next teacher cannot fix the student whose interest in the violin has been crushed because that student will have moved on to another extrascholastic activity. Kristen seems a lively and gregarious woman whose students might genuinely enjoy their lessons and be more motivated to practice and continue. That has to count for something too. Edited: February 14, 2019, 12:38 PM · Dorothy DeLay could not play better than her best students (Itzhak Perlman, + very long list). Being "better than your best students" is not actually a requirement. That said, DD did achieve a high level of playing and had arguably the best mentor around, when it came to teaching. And yet she still did it her own way. The real requirements for teaching are that you deeply understand how to play the instrument, how to teach various techniques, how to communicate, how people learn, etc. Learning to teach well is a lifelong endeavor, but it does not mean that a beginning teacher cannot teach, or that a beginning teacher is by definition a danger to his or her students because of lack of experience. If the teacher really can't play, doesn't know how, and worse, doesn't care, those would be disqualifying. Also, good heavens yes it's a good idea to have a curriculum for teaching beginners! There are entire pedagogy classes dedicated to this! This is arguably the most important stage, where an inattentive teacher can do the most "damage"! Kristen, it sounds like you are serious about learning to teach and becoming a good teacher. The things that will help you include gaining teaching experience, taking pedagogy classes, and continually examining your own playing. Enthusiasm and curiosity also help! Watch a lot of other good teachers, as well. Here's to the start of your journey! February 14, 2019, 12:48 PM · I haven't read the entire thread, so perhaps I've missed some kind of vital information, but in my opinion, someone who isn't a strong violinist AND who does not have any training in violin pedagogy is setting up their students to fail. I think that it is pretty unethical to position yourself as a violin teacher when you don't know what you are doing. The fact that this "school" is so willing to cut corners reflects extremely poorly on the "school" and on their priorities (making a buck off people's ignorance? ), but you can be the better person here. It seems like you would be much better positioned to teach oboe. If you decide to proceed, please consider that you have the ability to really set kids back in their learning. Teaching beginners is a very special skill, and one that should not be taken lightly. If you want some more violin-specific experience, consider volunteering your time with a middle-school or high-school music program and focusing on helping kids that are playing but cannot afford instruction. There is a population out there that your skills can serve, and I don't think that complete beginners are that population. February 14, 2019, 1:03 PM · If I recall correctly, Kristen is getting a master's in music education, so presumably she has had some instruction in pedagogy, even if it hasn't been violin-specific. Also, I seem to recall that she is already teaching -- she just hasn't been teaching this population of younger students. February 14, 2019, 1:45 PM · It seems like that trajectory would better prepare someone to be a highschool band or orchestra director. I'm not saying there aren't plenty of unqualified people out there already taking people's money, but I disagree with it. Edited: February 14, 2019, 4:25 PM · Dorothy Delay and Ivan Galamian were not known to be great players during the bulk of their teaching careers but they had both achieved a high level earlier on, and they both had an enormous depth and breadth of technical knowledge and understanding at their command. For the ordinary teacher who is not Delay or Galamian with their world of technical knowledge, I would consider being able to play better than one's best student to be a requirement. I have seen (and in many cases done my best to rehab) far too many students whose progress has been limited or even stymied by incorrect instruction. Edited: February 14, 2019, 7:11 PM · Mary Ellen, I guess I'm saying that we need to encourage new teachers, and telling them they can't teach until they've taught is possibly rather discouraging and even counterproductive. I taught my first students while I was still in high school, and I'm glad I had that experience. I'll add that I think I taught them pretty well, even though I definitely have a lot more to offer now, after 30 years of experience, a degree in music, pedagogy training, etc.! Teachers in my Suzuki group encourage their older and more advanced students to help out our group, to teach their own students in the summer, to get started teaching. We encourage them to take pedagogy classes as well. But sometimes getting experience teaching means teaching for new programs, trying things new ways, developing your own curriculum based on what you know, etc. It's actually a rather messy path, as all true learning is! When I was doing my Suzuki teacher training for Book 10 with Mark Bjork, an excellent professor and pedagogue at the University of Minnesota, he said to us, "You need to get over the idea that you have to have studied every piece your student plays." He was sharing how one of his students wanted to play the Shostakovich Concerto, but Bjork had never played it. In the end, he did teach it to his student, and it was a wonderful experience for both of them. Granted, this was a longtime college professor and he was talking to a group of teachers who had a lot of experience and training and who would be teaching advanced students. So does a teacher have to be "better than your best student"? It depends on your definition of "better," I suppose! I would concur that a person who has never studied anything beyond Suzuki Book 4 probably should not teach someone the Mendelssohn Concerto, unless that teacher has some other serious musical cards in his/her deck! February 14, 2019, 7:04 PM · The OP asks for help with finding online resources to help her pursue her goal of becoming a better Suzuki teacher and the thread devolves into a discussion of her suitability to teach absolute beginners using words like “unethical” to characterize her ambition. Really!! This is so wrong on so many levels! Edited: February 14, 2019, 8:15 PM · James, the "devolving" mostly happened after Kristen basically said she had what she needed and was bowing out of the thread. Prior to that, much of the thread was emphasizing the importance of formal violin pedagogical training (i.e., Suzuki teacher training), which the OP says she cannot afford right now. I did say, in my initial post, that the OP shouldn't try to teach at levels approaching her own playing skill. I had in mind "not past Book 4" but I bit my tongue. Later Mary Ellen wrote exactly that, which made me feel smart for about 3 seconds. Remember the teenager in Florida who was actually practicing medicine? Yikes. Now, obviously the stakes are not as high when we're talking about violin lessons, but the potential for harm is not zero. On this very forum we hear constantly from people who have developed pain in their shoulders, necks, arms, wrists, hands, etc. February 14, 2019, 9:29 PM · As I understand it, the way that Suzuki teacher auditions are set up already reflects the reality and dichotomy of student needs versus potential teacher supply. There's a book 4 audition that qualifies a teacher to take the first four books of training. Reasonably competent playing is required -- I suppose sufficient that the audition committee figures that the player will be capable of teaching the basics to a student. This is also suitable for multi-instrumentalists -- for instance, violinists who would like to be able to teach some cello without being super-accomplished cellists themselves. There's a book 7 audition that qualifies a teacher to take the first seven books of training -- essentially to the Bach A minor concerto, an intermediate level. My understanding is that the intent is that this is to be played at the level of someone who has done a bachelor's in music (albeit possibly music ed rather than violin performance), and is a reasonably accomplished violinist. And then there's a "comprehensive" audition that requires Mozart 4 or 5, which in theory is to be played at the level of someone who holds a master's degree in violin performance. That seems to be the expected level for teaching advanced students. Public school music educators get students started on the basics of many instruments without more than a passing familiarity with many of them. Teaching functional beginner technique is very different from teaching more advanced stuff, though. By the way, my teacher frequently teaches repertoire he himself hasn't learned and performed. But there's a huge difference between a virtuoso who's able to sight-read a major concerto and a music educator who struggles at the Suzuki book 7 level. Edited: February 14, 2019, 10:21 PM · At no point did I say that I thought the OP should not be teaching. I suggested what I thought (and still think) is a reasonable upper bound on her teaching given what we know about her current level. This can and should be a moving target as she gets more training. Surely we can all agree that not every teacher should be teaching every level. February 14, 2019, 10:33 PM · "This can and should be a moving target as she gets more training." It just occurred to me, not sure why, that the OP would benefit not only from continued training in pedagogy, but also from having lessons herself and practicing 2-3 hours a day to bring her own skills beyond Book 7. Mastering the first movement of the Bach A Minor with the purpose of meeting the 2nd-tier Suzuki audition would be a worthy initial goal. February 15, 2019, 8:08 AM · A kid at age 4 spending 2 years in book 1 isn't extraordinary (and maybe with a super-wiggly inattentive slow-learning 4-year-old, you spend a year on Pre-Twinkle plus two years on book 1). But I'd really wonder what the heck is going on when a 7 year old is taking 3 to 4 years to get through book 1. I'm currently pondering Suzuki teachers for my son for when he turns 4 later this year, and debating whether it's preferable to study with someone who is awesome with kids but only a passable violinist (say, someone who can play a Bach A minor with work), or study with someone who is still good with kids (but perhaps less awesome with the littles) but a more capable player (say, someone who can play in a freeway philharmonic that is below ROPA level). Mengwei, there really shouldn't be avenues closed to you with a non-music degree, as long as your playing is at a sufficiently high level. February 15, 2019, 8:30 AM · My teacher has a group class every other Saturday morning for his studio. Students are required to attend (and yes they pay extra for it) until they are good enough to join the Chamber Orchestra (around Suzuki Book 5-6 level). This is an extremely good thing for the kids because they learn to listen, learn to "share the sound," and they see whether they are ahead or behind their peers. Lydia, at the music camp where my kids go (Blue Ridge Suzuki Camp) there are a couple of teachers from NoVa. In my opinion they're both very good -- including good with small children. Call or email if you want to discuss. "Share the sound" is a phrase I got from an amazing cello teacher named Wayne Krigger. Edited: February 15, 2019, 10:34 AM · I want to clarify my comment that a teacher should be able to play (hopefully much) better than his/her best student, since Laurie pushed back on it. What I had in mind when I wrote that was the ordinary violin teacher in the trenches, someone teaching primarily children up through high school, not an artist teacher teaching artists, say at Juilliard (as in Delay/Galamian) or in an equivalent setting. At the highest level, what matters is not so much whether the teacher is objectively speaking a better player than the student; it is the depth of the teacher's understanding of technique, artistry, and the subtle nuances required to help someone move from being an ordinary artist playing at a professional level to someone very special indeed. As one moves down in level of playing, the distance required (in my opinion) between teacher and student increases. For example, someone whose highest personal artistic achievement was Tchaikovsky concerto can most likely guide a student through Bruch. But a teacher whose peak accomplishment was De Beriot #9 probably shouldn't be trying to teach the Bach Double, and someone whose most difficult finished piece was Vivaldi g minor (Suzuki book 5) definitely should not be teaching Vivaldi a minor (Suzuki book 4). It is vanishingly unlikely that a Vivaldi g minor player will have the depth of understanding required to teach someone who is nearly as advanced. Taking this to its ridiculous logical conclusion, I can't imagine anyone disagreeing with the idea that someone who has just finished Suzuki book 2 has any business guiding beginners through the Twinkle variations. They just do not have the background knowledge required. There is much more involved in getting a beginner off to a good start than simply telling them where to put their fingers. As a side note, I get a little tired of the defensive statement that there are excellent players who are horrible teachers. Of course there are, but this in no way means that all excellent players are horrible teachers nor does it mean that all average players are great teachers. I recently encountered two students who in my opinion were either ruined (the 12th grader) or nearly ruined (the 9th grader) by incompetent private violin teachers. One of the aforementioned violin teachers, as far as Google would tell me, appeared to have no qualifications whatsoever--no music degree, let alone from a known school--aside from a self-proclaimed history of "decades" of teaching the violin. The other one had a performance degree from a recognized if not quite top-tier music school. Both of them did their students a terrible disservice. The less qualified teacher failed to teach the most basic technique and apparently did not notice that their student couldn't actually read music properly. The more qualified teacher also failed (less spectacularly) at teaching technique but even worse, had given the student pieces to work on that were entirely and inappropriately too difficult. February 16, 2019, 9:48 AM · Lydia - I just meant I can't get hired at a school that advertises degreed faculty and had gone the private studio route instead. I had a non Suzuki teacher after book 6, then left off at Kabalevsky before college, never even got into the standard repertoire, other than messing around. Focusing on taking my adult playing to the next level (as opposed to being on maintenance mode or declining) hasn't been a priority for various reasons and non audition community orchestra is all I can handle right now. If I let a 4-year practicing type do 2 years, and it's a disservice to the student (and the future teacher). I've also been extremely thoughtful about both violin-specific and general musical development, which I'm sure contributes to "slowness" on repertoire but it's worth it. I have taught children of violinists beyond my level and have to assume they (parents) liked what they saw when visiting my group classes or studio performances. February 16, 2019, 7:53 PM · "15-20 min/day x 2-3 days/week" is the working definition of a low-priority activity. February 17, 2019, 9:48 AM · I have a concern about some of the content of this thread - which says that it's OK for shall we say not highly accomplished teachers to teach younger children and less advanced players, and more accomplishment is required to teach the more accomplished students. The flaw in this reasoning in my view is that at the elementary levels the basics are important, and it might be that the teacher is not highly accomplished because of flaws in their own basics. I think that's true for me - that I would be able to advance further was I not being held back by my own errors or issues with the basics, which to some extent I have to relearn to progress. When I was inquiring about choices for private academic study for my own child, I thought it might be best to save the money from the early years so that it might be employed later, when it might make more of a difference. What I heard from academic teachers was the opposite - that it's harder to teach the very young, and that investments in the earlier years give more benefit over time. Of course this statement or collection of opinions is not a proof, but it is a valid consideration. Advanced playing is proof that that person has mastered the foundational work sufficiently to enable the more advanced playing. It does not mean that that person is conscious of all that took, and is able to teach well - the contrary might be true, that the person has latched on to some ideas which are not sound, which does happen - we're taught some things which don't always work and are sometimes harmful. A prospective teacher not being an advanced player has a risk that that teacher's own technique and understanding have flaws which retard further progression. As Mary Ellen has written above, some teachers do harm their students. The very young may be more resilient, but they also need greater care, so that they are not harmed. Edited: February 17, 2019, 1:43 PM · My expectation is that someone who is qualified to teach elementary level players is playing with correct technique themselves. I'm fine with a De Beriot #9 level player teaching up through about Suzuki book 3 or 4 *if and only if* that player could play De Beriot #9 in tune and at tempo with a good sound using correct technique (assuming the violinist in question also has good pedagogical skills). If they struggled with the De Beriot, then I would suggest that their true playing level is somewhat lower. Someone whose own basic violin technique is flawed is someone who should not be teaching anyone. February 17, 2019, 3:09 PM · For comparison, De Beriot #9 (A Minor) appears at RCM grade 9. The Bach A minor (Suzuki book 7) appears at RCM grade 8, and the Mozart D Major K.218 (Suzuki book 10) appears at RCM grade 10, so on that basis, a rough correspondence of De Beriot #9 is with Suzuki level 9. February 17, 2019, 4:00 PM · Suzuki book 9 is Mozart 5 and Suzuki book 10 is Mozart 4. You could probably make an argument that DeBeriot 9 is either easier or more difficult than those, but I suspect that the reason that the Suzuki comprehensive teacher audition uses one of those two Mozart concertos is the same reason that they are often required for concertmaster auditions -- they are a very clear demonstration of whether or not someone's fundamental technique is solid. I have the impression that a lot more Suzuki teachers take/pass the book 7 Bach A minor audition, than take/pass the comprehensive, though. February 17, 2019, 6:48 PM · I am known in my community as a jazz pianist. I have one student. He is learning all kinds of stuff -- some theory, how to dress up "easy piano" arrangements of pop tunes, some improvisation, etc. On the surface, anyone would have said that he should have done better with the other (much better qualified) teachers that he had before, but the fact is, he didn't. His parents (longtime friends) were well aware of my inexperience teaching piano (i.e., never before), but they were ready to try something unorthodox, and they seem satisfied with his progress. I feel that my student is getting out of his lessons as much as he's putting effort in at home, which I believe is all anyone can ask of a teacher. I charge about half the going rate in my town -- not to undercut anyone but in recognition of my lack of bona fides. Just for thrills I looked up Suzuki Piano Books 6 and 7 (that's where they end, apparently). I can play that stuff, but if I wanted to perform it, I'd need to spend time on it. In Book 6 there is a gorgeous Mozart sonata (K330). I studied it as a teenager. This "simple" piece was chosen by Vladimir Horowitz for his long-anticipated return to Moscow in 1986. That would be like Hilary Hahn playing La Folia at the Proms. I can't play Mozart like the 83-year-old Horowitz did that day. But I don't think that's a prerequisite for me to teach a high-schooler how to play tunes by Elton John or Dave Brubeck. Edited: February 17, 2019, 6:51 PM · I have never understood why the Suzuki books teach the Mozart concertos in reverse order (5, 4, 3) when the order of difficulty is actually (3, 4, 5). De Beriot #9 has some technique but I teach it long before I would consider giving Mozart to a student. There is no comparison in musical difficulty, or in the level of bow control required, either. Mozart is taught too early far too often, and butchered far too often as a result. I often teach De Beriot #9 fairly soon after Bach a minor. Regardless, my point is that someone playing at that level--say, a late intermediate player--can make a fine teacher of beginners up through early intermediate IF the teacher is playing with correct technique. February 18, 2019, 5:32 AM · This thread has made me feel like I really need to learn de beriot #9. Editing to say, by which I mean the first movement. February 18, 2019, 9:24 AM · Suzuki does not contain Mozart 3, by the way. February 18, 2019, 10:27 AM · I don't know why concertos can't be revisited when a student has matured considerably. Granted, one does not assign Mozart 3 to a student in Book 5. But the idea of waiting to learn something until you can play it like Heifetz after 3 weeks of practice seems a little counterproductive too. I think if you've done Bach A Minor, a few Handel Sonatas, Accolay, and Haydn G Major, then you ought to be able to deal with the first movement of Mozart 3. DeBeriot No. 9 is a hard piece. It is basically all cadenza (i.e., a series of technical aggravations) with benign (largely meritless) accompaniment. Yet it is included in "Solos for Young Violinsts," whence it is relentlessly butchered by students who have never played so much as a movement of solo Bach or a Mozart concerto because their teachers feel these pieces should be only be touched when the student is 'ready' even though in many ways they are easier. The only part of the first movement of Mozart 3 that is technically harder than DeBeriot No. 9 is the cadenza, which wasn't even written by Mozart. "Oh but it's musically harder!" Spare me. Demonstrate what you want to be happening "musically" on your violin, let your student see how you are doing it technically, and they'll have it nailed in nothing flat. For the 10-year-old Book 7 student, musical and technical problems are essentially indistinguishable. If you want to prepare yourself for the DeBeriot, I respectfully suggest that you get the Franko cadenza for the first movement of Mozart 3 and work on that first. It's shorter. Edited: February 18, 2019, 11:00 AM · De Beriot #9 sounds hard but it is just not that hard for the student who is ready and the teacher who knows how to teach it. It is the most teachable of technique. For that matter, the Franko cadenza contains harder technique than De Beriot. Please do not underestimate the amount of bow control necessary to play Mozart concertos (NOT the cadenzas) well. Technique encompasses both left and right hands, and frankly the right hand technique is harder for many students to learn and also harder for some teachers (certainly including myself in this) to teach. The Barbara Barber books are arranged in ascending order of difficulty and IIRC she has De Beriot at the end of book #4 (out of six books). For comparison, the last piece at the end of book 6 is Rumanian Folk Dances. I agree with her.